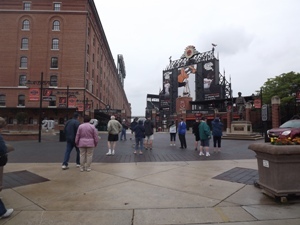 Before we went to see the Mets, we went down to Baltimore to tour Camden Yards. Statue of Babe Ruth as a boy. 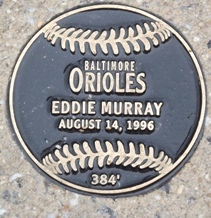 He was born and raised in Baltimore. 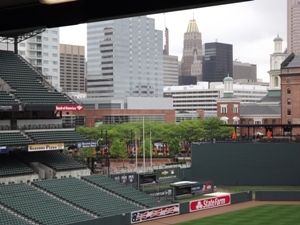 It was the 20th anniversery of Camden Yards. Can't believe that. Seems like just yesterday. 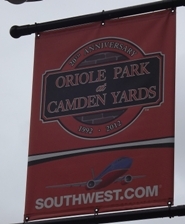 On the street between the park and the warehouse (see picture above), many home run balls have hit. They put a plaque for each on on the street. I like this quote from the great manager of the Orioles... I think it is one reason why I do like baseball. 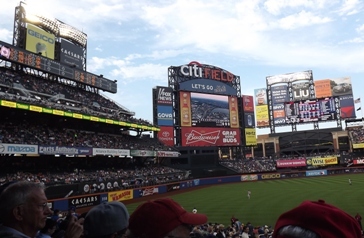 Citi Field from the bus. The main entrance rotunda. LOTS of security. 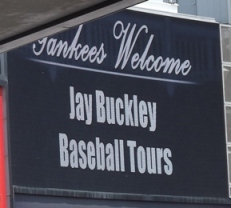 The onion tour continues. Not ONLY do they have onions and relish, but sauerkraut, and jalapenos! Lots of scoreboards. Almost information overload in the parks, now. OR, you have so many places to look for informaiton, you can't find it (like the MPH of the pitch), I did like the away board. You can see how many outs and how many runners are on with lights. 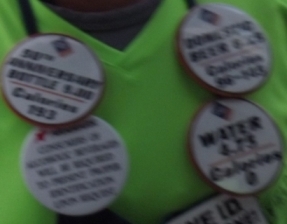 This is blurry, but NY state requires the vendors put the calories on the vendor buttons for what they sell. This shows water at 0 calories, and lite beer between 98 and 143. Does that depend on how much is spilled passing it to you (haha)? (Not shown - hot dog - 310 calories). 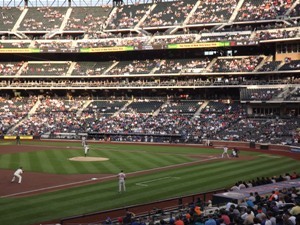 Picture of the field of play from our seats. David Wright of the Mets (see the ball he just hit in the picture?). Welcome to our tour group! 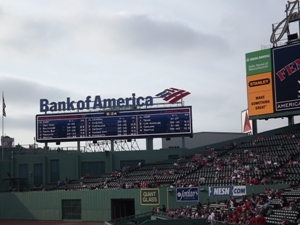 Don't know if it was on any of the previous scoreboards, but I saw this one, and started to pay attention. 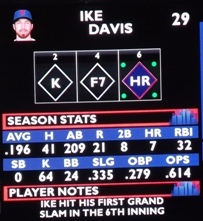 Ike Davis' batting average may be below the Mendoza, but this night he hit a grand slam - his first career grand slam. He might have been the player of the game, however..... 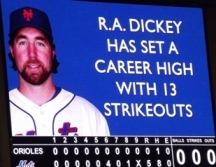 The pitcher for the evening only gave up 1 hit, and set a career high for strikeouts. Nice knuckleball. 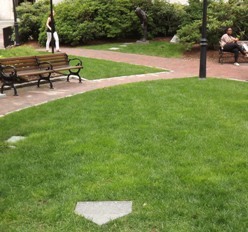 Site of the first World Series (engraving on the plate) 10/1/1903 Pittsburgh Pirates v. Boston Pilgrims (later Red Sox). Cy Young statue is in the background between the bushes, so you can envision standing at the plate with Cy Young throwing to you. Nothing is left, except these reminders on the campus of Northeastern. 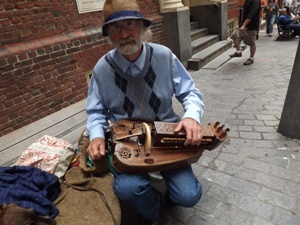 While walking Boston, came upon this gentleman playing a Hurdy Gurdy. 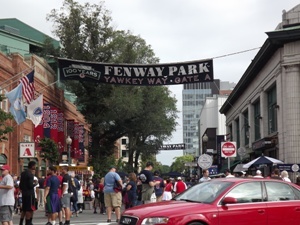 At Fenway - Yawkey Way is now incorporated as part of the park, it doesn't open until 2 hours before, and you 'use your ticket' upon entering. 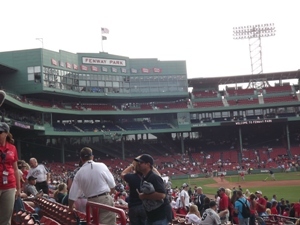 Statue of Ted Williams. I really like this one. 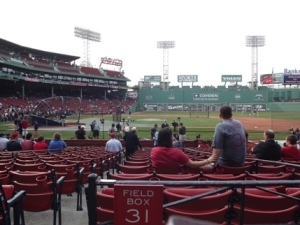 100th anniversery of Fenway. Say it ain't so - packaged onions. Ugh. And we were doing so well on the onion tour. (I did check several stands, and they were all packaged onions). Salty sighting. Unfortunately this night was a night off for him. 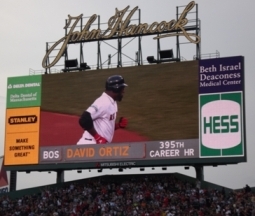 We were able to see Big Papi hit 395! The Manager of the Miami Marlins. Can you imagine having that seat? 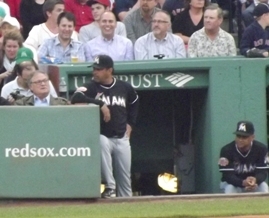 "Say, would you pinch hit for this guy?" 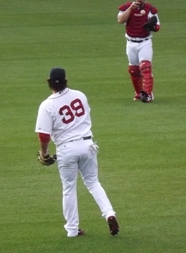 'Pedy' with a hit. 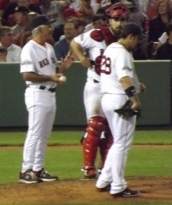 Call to the bullpen featuring Bobby V. The final - relatively quick for a Sox game (2:53). 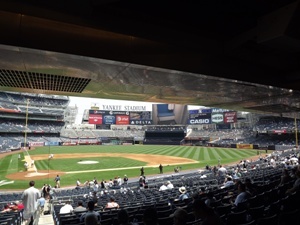 New Yankee Stadium from the road. The 'bat' in the foreground is a smokestack. 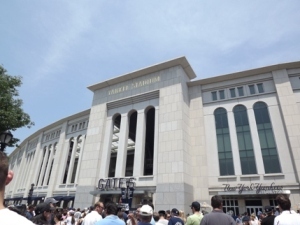 The front of New Yankee Stadium. 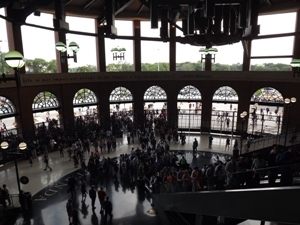 Not much time to walk around front, as there was traffic getting there, so it is only about 45 min before first pitch. 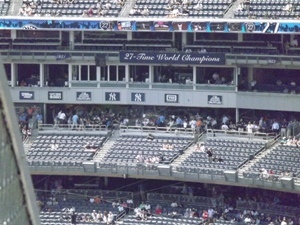 The main entrance rotunda filled with banners of Yankees past. First sight of the field. 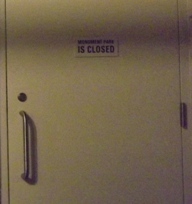 The Monument Park is closed 45 min after the doors open. 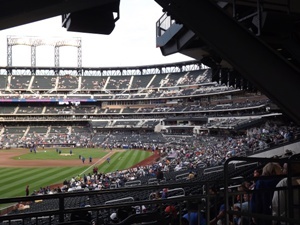 So if you want to see it, get there early and head straight for the park. 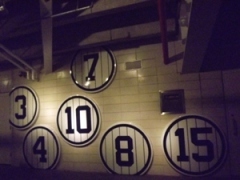 They have the retired numbers on the wall outside of monument park (this is not all of them). 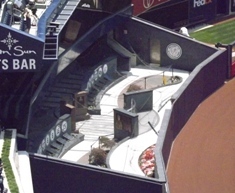 There are areas where you can look down into the park (this is from the upper deck.) 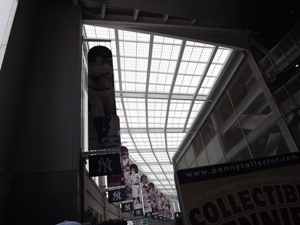 But you can't see it all, some is under the overhang. 27-Time World Champions. Braggers. 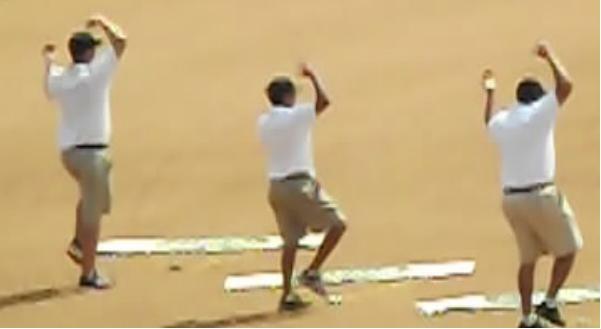 :-) The ground crew doing the Y-M-C-A dance after the 6th. 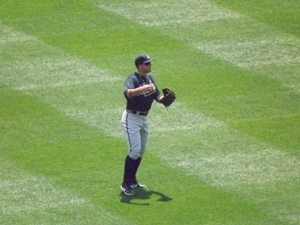 Martin Prado in Left. 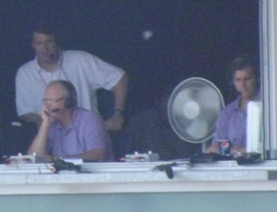 Braves broadcasters - Joe and Chip. 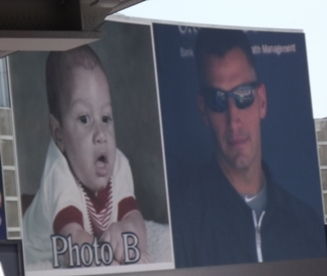 They have a photo game to match baby pictures with current players. Today it was Andy Pettitte. Welcome to our group! 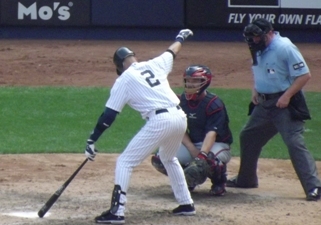 When I think of Jeter, I think of this pose. Martin on 2nd. He had a good day. Braves win! 9 homers combined between the teams. 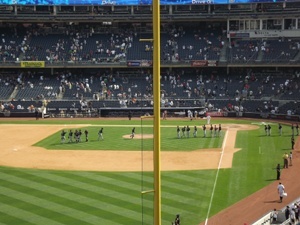 A record for New Yankee Stadium (but it isn't that old.) Celebration walk. From the paper the next day. 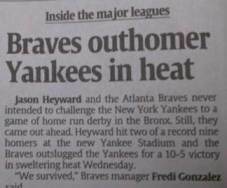 It was over 100 on the field, and sometimes felt like that in the stands. Fortunately, we were under the shade. 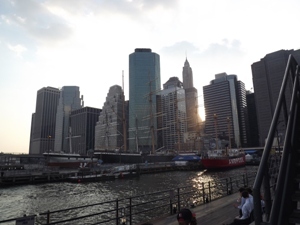 After, we took a quick drive through Manhattan with a guide pointing stuff out along the way and had dinner at Pier 17. 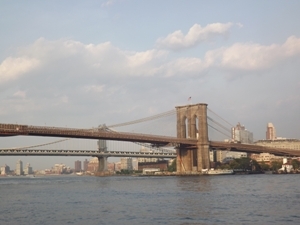 These are pictures from the Pier 17. 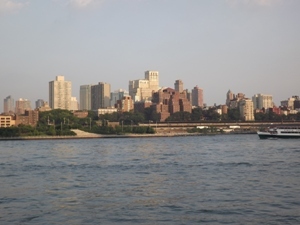 Manhattan from Pier 17.